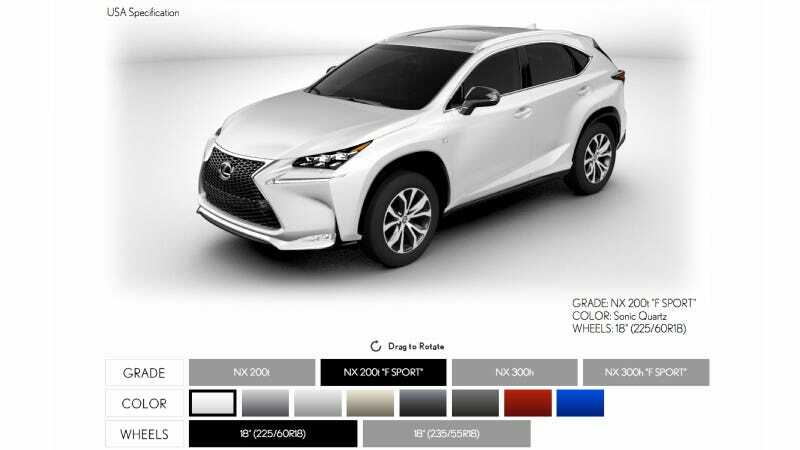 The online configuratior for the aggressively-angular 2014 Lexus NX crossover is now live, giving you free reign to set one up and spin it around in any of the four trim levels, assorted wheel options, and ten colors it's going to be available with at launch. You can access the tool here on Lexus's NX site; scroll down a little and click "configurator" at the lower-right. Still no prices, but the 360º rotator lets you inspect the insanity of the crossover's shape to your heart's content. I'll be driving the NX at the end of the month, so start thinking about some questions you'll have about it! Share your build here and tell us which angles you love and which you don't. Hat tip to Taylor V and the Lexus NX Forum!